Ever tried to look for a surfski from a helicopter? Or from a rescue craft on the water? Here's the story of our exercise with the South African National Sea Rescue Institute. The purpose of our exercise was for the NSRI to gain some familiarity with surfskis under controlled conditions - and for the paddlers to understand the challenges facing the NSRI. We also wanted to try out various items of safety gear - and to learn about the drift rates of disabled skis, etc. 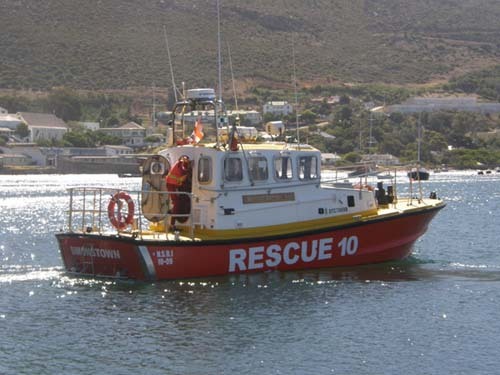 The NSRI laid on the Vodacom Netcare911 Surf Rescue helicopter and the Station 10 (Simonstown) rescue boats - the 10m "Spirit of Safmarine III" and a 5.5m RIB. We were fortunate with the weather - which saw us paddling in classic "Millers Run" downwind conditions: 25-30kts of wind and 1-2m breaking waves. This meant that the exercise was held in realistic conditions. We decided to do two runs - one to exercise with the helicopter; the second to work with the seaborne craft. We had three skis to work with - two plain white skis and an all-red ski. I was wearing high visibility clothing (orange Huki long sleeved shirt; red PFD); Wayne Borchardt wore a blue shirt with bright orange PFD and Gordon Brown wore a black sleeveless wetsuit with a black PFD. The first item on the agenda was for the chopper to search for us and, having found us, to execute runs at various altitudes to work out the best height at which to search. The white skis became visible at a range of about 300m! To illustrate the challenge faced by airborne searchers, here's a game called - "hunt the ski"! Click on the link below the image to see an enlarged version - and try to find the skis. Here they are: click the link below each image to see where they are. The red ski is much easier to spot. Gordon had a "space blanket" - a thin sheet of reflective sliver foil often used by rescue services to wrap around hypothermia victims. He unfolded it and held it by the edge so that it fluttered in the wind. The helicopter crew reported that it was highly effective - the sun reflected off the foil and drew their attention to the glints of light. This is highly recommended - the folded up blanket weighs a few grams and can be stored in your PFD's pocket. We obtained permission to shoot a couple of red pencil flares. The chopper crew reported that the flares were easy to see, even in daylight. Interestingly, although the flare itself lasts only a few seconds, the smoke trail remained intact moving downwind with the mass of moving air acting as a pointer for the chopper crew to look for the ski. Although by no means can they be considered infallible, the pencil flares are effective - more so of course at night. The NSRI emphasize that you should always keep one or two flares for when the rescue craft is close to your position. We tried both mobile phone and VHF radio communications with the chopper. The mobile phone was ineffective because the chopper crew couldn't hear me - and the radio was ineffective because I couldn't hear them! In both cases, the problem was caused by the level of noise in the helicopter cabin. However, this was due to the particular configuration of the helicopter and in most cases the VHF radio would be extremely effective in communicating with airborne crews. Having completed the airborne part of the exercise, we all headed back to the NSRI base for lunch. Gordon, Wayne and Elsa were replaced by Dawid and Nikki Mocke and Dale Lippstreu who'd agreed to the test subjects for phase II of the exercise. We sent them off to Millers Point to start a second run. Alain Jaques and I got onto the Spirit of Safmarine III to join the crew in searching for our errant skis. In contrast to the airborne crew's findings, we discovered that, perhaps unsurprisingly, from sea level the color of the ski made less difference, while the brightness of the paddlers' clothing was important. However, the first thing that struck me was just how little visibility there is from a surface craft going upwind into a 25-30kt breeze! Sheets of water were sweeping over the bow of the craft and we could see virtually nothing. Once again the paddlers spotted the rescue craft long before they became visible to the rescuers. First of all Dawid called us up using his mobile phone. We could hear him clearly, and he was able to guide us to his location by telling us to steer left or right until we finally saw him and the other two paddlers. He also tested the VHF (a waterproof handheld Icom M71 Marine VHF radio) - again we were able to hear each other clearly. The VHF is much easier to use than a mobile phone simply because you have only to squeeze the talk button - some mobile phone screens are difficult to read in sunlight, and it's often quite tricky to dial a number through the thick plastic of a waterproof pouch. It should be remembered though that it's much easier to answer a call than to make one - so rescuers should try to find out the mobile number of the victim so that they can initiate communications. Dawid also tried tying a small neon orange flag to his paddle - this was quite effective. The next item on the agenda was to measure drift rates. We volunteered Dawid to get in the cold water and hang from his ski, while Nikki and Dale simulated rudder/paddle failure and rafted together. We made them drift for 15 minutes. 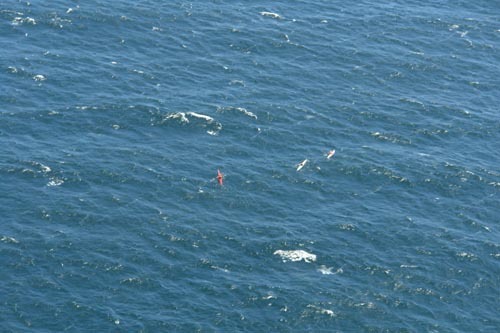 Dawid allowed his ski to drift downwind parallel to the wind and waves while he tried to keep as much of his upper body out of the water as possible. He drifted about 800m at a speed of approximately 3km/h. Nikki and Dale drifted at a higher speed - and then discovered that by using their rudders, they could make their skis point directly downwind. In short order, without paddling, they found that they were now moving at nearly 6km/h. Note to self: if you raft with someone, you can proceed downwind with a fair amount of directional control - on a Millers Run for example, you'd eventually get to Fish Hoek. You'd take a bit longer than normal, granted, but you'd get there in the end. Then it was Nikki's turn to get wet. We made her abandon ship, letting go her ski. In no time, the wind had caught it and it was rolling downwind, much faster than she could swim. Dawid came alongside and she climbed onto the rear deck of his ski, lying face downwards behind him. She placed her paddle underneath her and was able to "swim", assisting Dawid who paddled to where her ski was still rolling its way downwind. They were able to recapture the ski and she remounted... only to be told to do it again - this time tethering her paddle to the ski. When she let the ski go again, it still rolled downwind. However, the paddle did slow it down, and she was able this time to swim after it to catch it. The lesson? In a strong wind, it's vital to have some sort of leash - and an ankle leash is clearly more effective. We now confiscated Dawid's paddle, giving him a replacement that had one blade broken off! He tried paddling with one leg out, but quickly found that he needed his steering. Dawid being one of the best paddlers in the world, he was able to take off downwind almost as fast as if he had a fully functional paddle - but he said that even for him it was exceptionally difficult to stay upright. Next we told Dale that he'd just broken a rudder line - he was to try jamming the rudder with some duct tape. After floundering about at the back of the ski, he failed to get the rolled up piece of duct tape to stay in place. If you're going to carry something to jam the rudder in an emergency, make sure that you've tested your solution first. Dale has once before experienced this situation for real - on a Millers Run. He said the worst thing about the experience was almost losing his grip on the tail of the ski. To get to the back of the ski he had to undo his ankle leash - and it made him feel very exposed. Almost as fast with one blade! 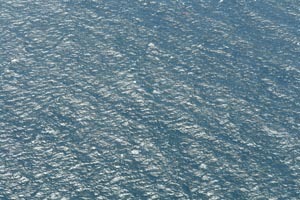 Skis are incredibly difficult to spot, from the air or from the sea. Choose a brightly colored ski and wear bright clothing! You will see your rescuers long before they see you so you must have communications equipment to attract their attention, and ideally to enable you to "talk them in". There is no single measure that you can take that will keep you safe 100% of the time - but every precaution and piece of safety equipment that you carry changes the odds just that much more in your favor. 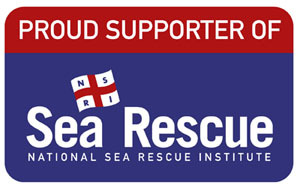 The NSRI is manned entirely by volunteers and they rely on donations from the public for their funding. Any South African paddler reading this should consider making a contribution - you never know when you might need them! 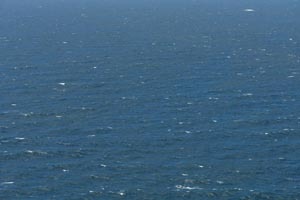 See http://www.nsri.org.za/ for more information.